Skip to the good stuff! 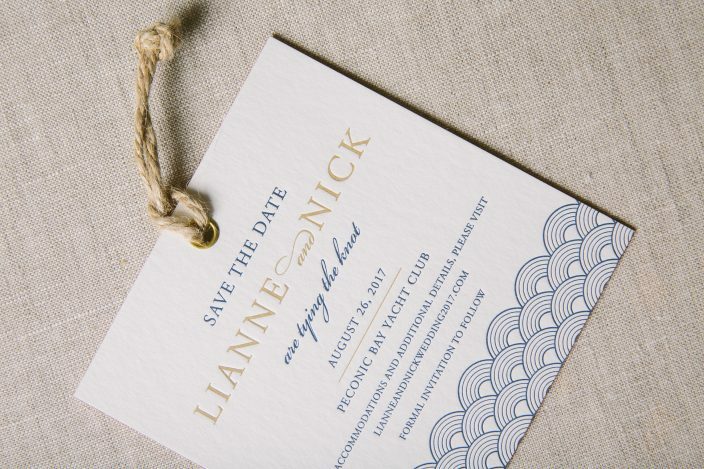 This save the date gives “tying the knot” a whole new meaning. 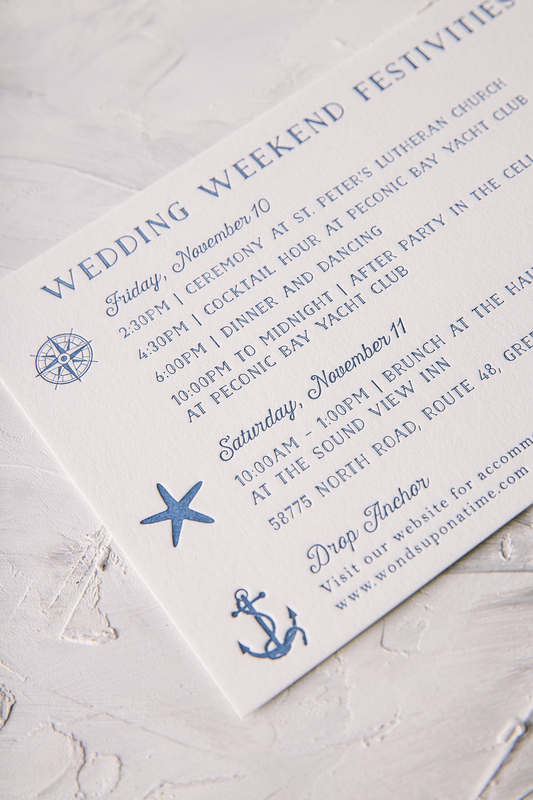 Lianne and Nick worked with Ipanema Press to make their nautical letterpress save the date vision come to life. 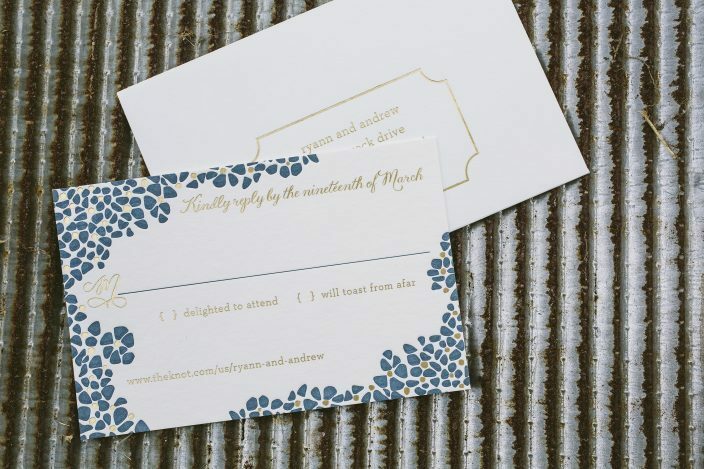 The majority of the card printed in Navy letterpress let the touch of Gold letterpress on the names pop off the page. Additionally, the grommeted card with twine pulled through made this petite card even more unique. 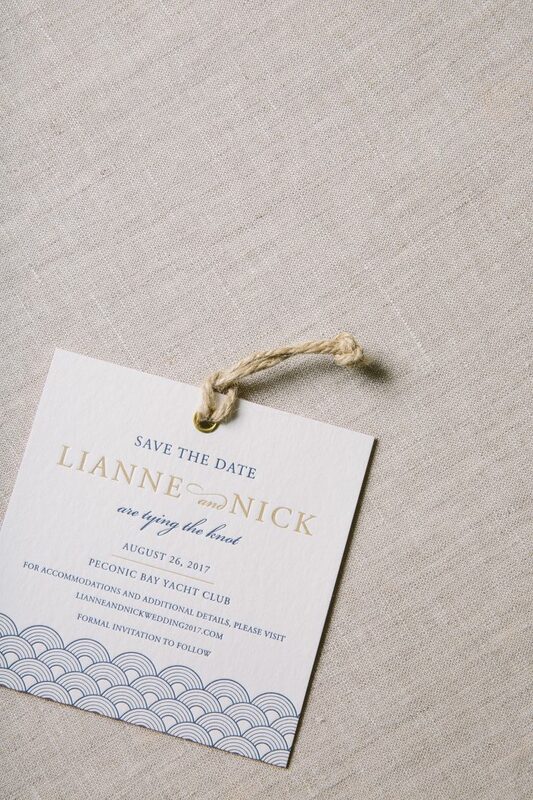 Since the couple married in the nautical setting of Peconic Bay Yacht Club, this save the date matches the aesthetic of the venue perfectly. 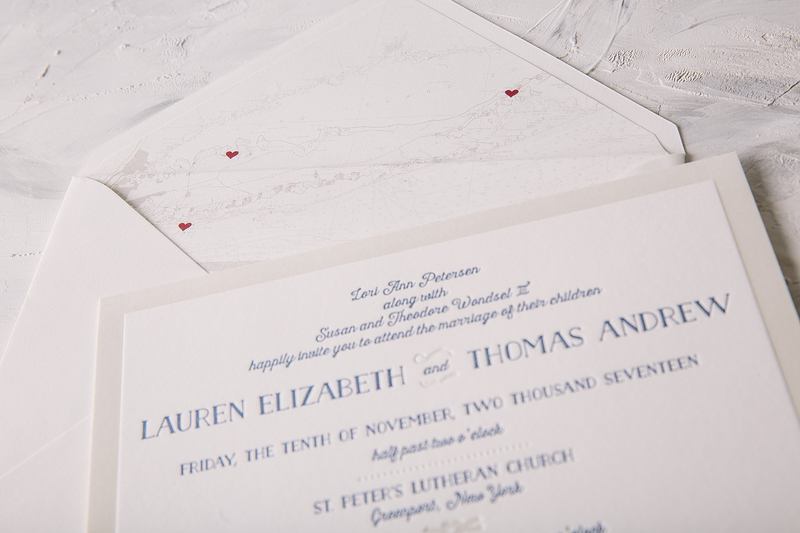 Lauren and Thomas used our Ashbourne design as the inspiration for their nautical letterpress wedding invitations created thanks to the help of Fat Cat Paperie. 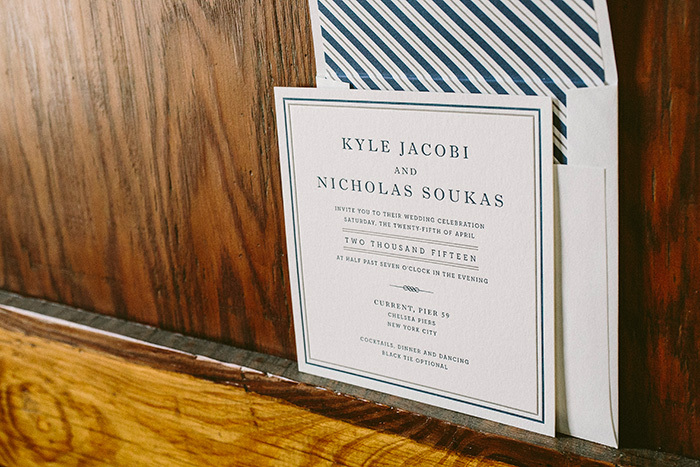 They kept the Sand letterpress border and combined this with Navy letterpress as a seafaring nod to their reception venue of Peconic Bay Yacht Club. 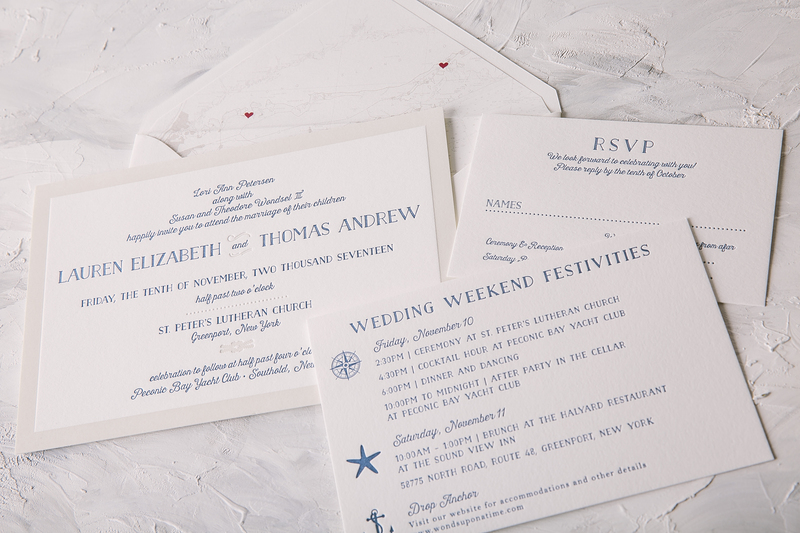 Other subtle yet purposeful touches include the compass, starfish and anchor motifs found on the weekend festivities card also printed in Navy letterpress. The reply card was kept simple and clean as another piece within the suite. 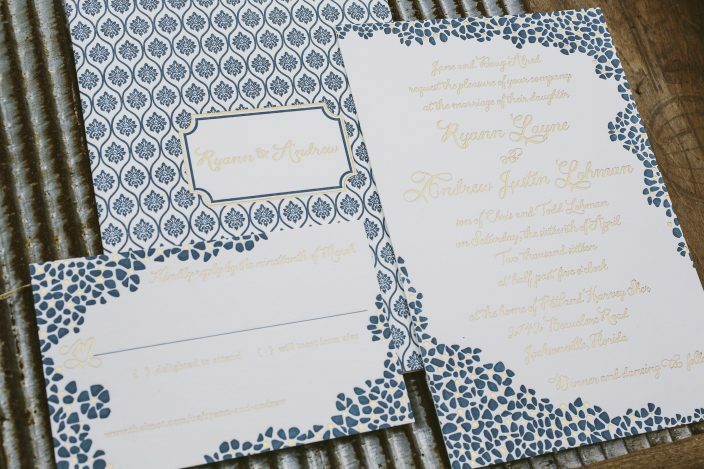 They added an envelope liner pattern as a sweet way of incorporating a map of the area with heart motifs highlighting places of importance to the bride and groom. It’s easy to say that Ashbourne was the perfect invitation inspiration for Lauren and Thomas’s nautical affair. Meresa and Eric got married this past December at the Omni Amelia Island Plantation. 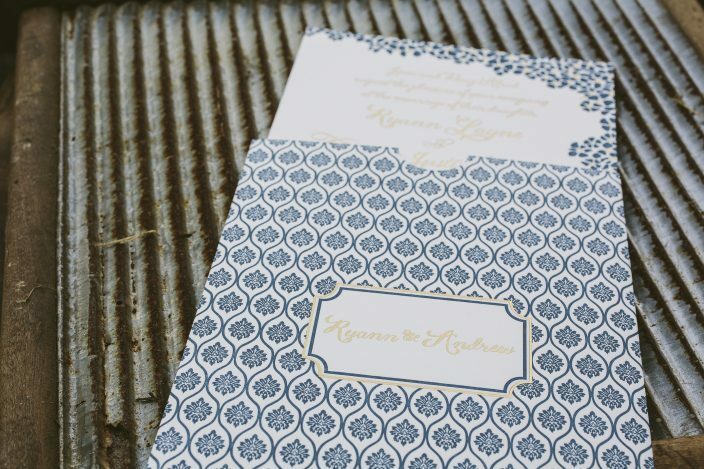 These polished foil stamped wedding invitations beautifully reflect their resort in Amelia Island, Florida. 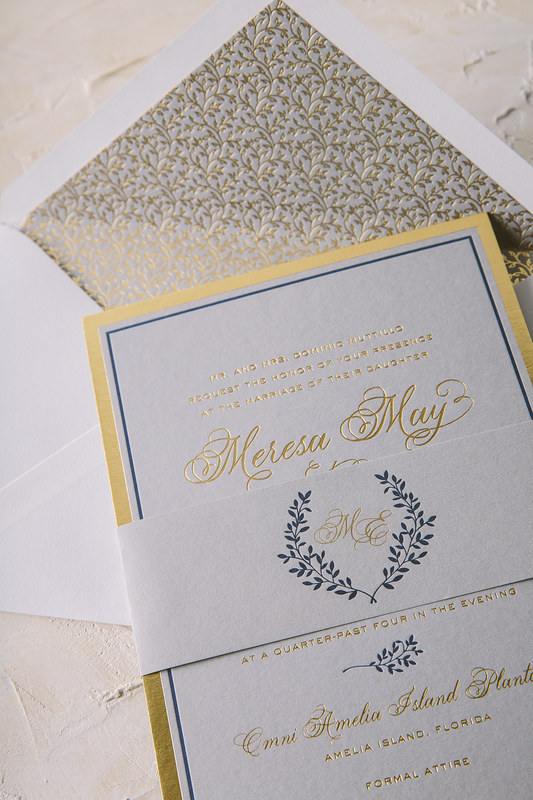 The invitation was printed in our Navy letterpress color and Gold Mate foil stamping accents on our gray paper, a color combination that creates an elegant overall aesthetic. 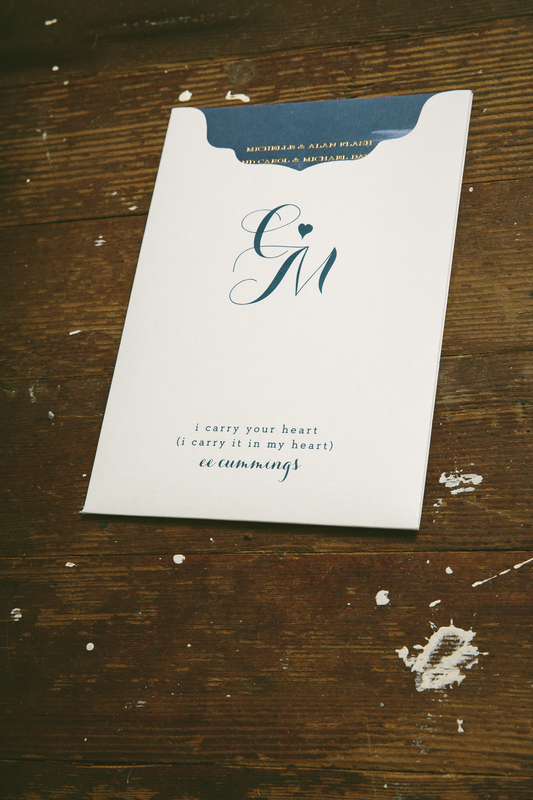 The color palette was also carried onto the insert cards as well as onto the belly-band which featured a monogram in honor of Meresa and Eric. Throughout the suite, little botanical elements were added throughout the suite to add a romantic touch to this formal suite. The gold matte envelope liner tied everything together effortlessly with the help of Creative Touch. Cara and Marshal customized our Barnesly design for their wedding at the Hotel Du Village in New Hope, Pennsylvania. 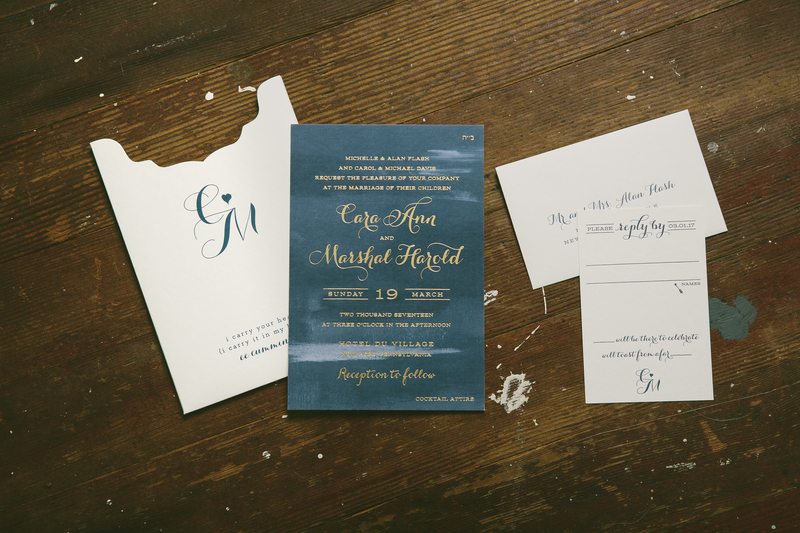 These moody navy watercolor invitations with gold foil stamped accents were created thanks to the help of our friends at ORRganics. 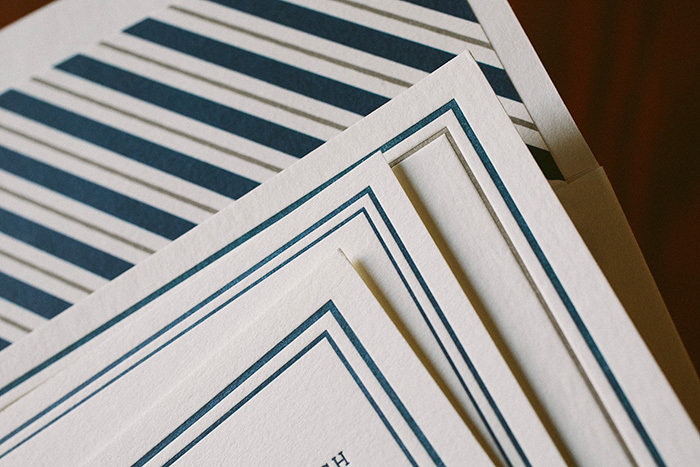 The suite contains a corresponding reply card and reply envelope printed in our crisp Navy letterpress. To keep everything safe and sound, they opted for our Juliette sleeve with a monogram accent and an E.E. Cummings quote was also added as the sweetest finishing touch. Natasha and Jordan reimagined our Vista design with the help our friends at Needle in a Haystack. 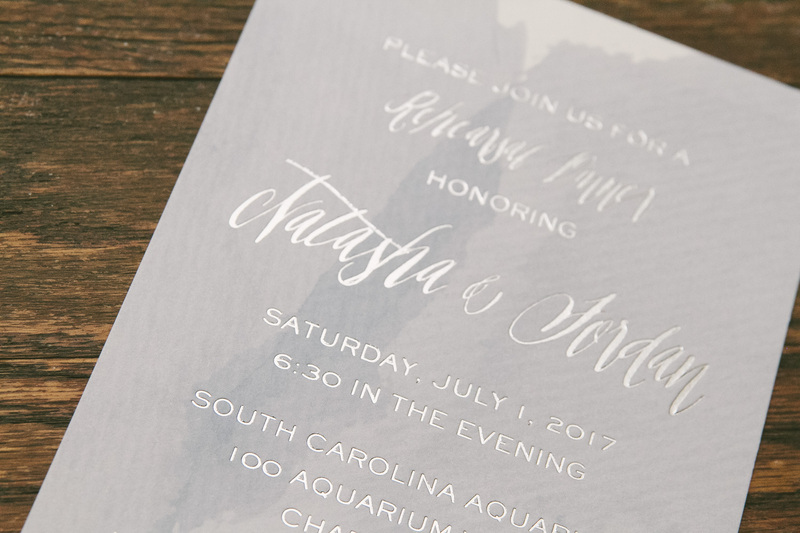 These watercolor rehearsal dinner invitations were a modern nod towards their South Carolina Aquarium venue. 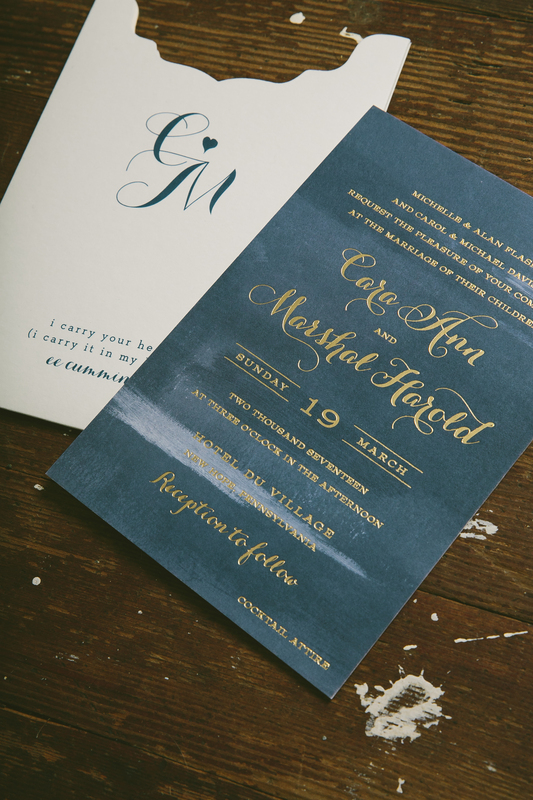 They opted for contemporary fonts that have never looked better while dressed up in our Silver Shine foil; all paired against a navy wash background. Our Dixon pattern as the envelope liner printed in Slate and Sky was the perfect compliment to this subtly aquatic set. 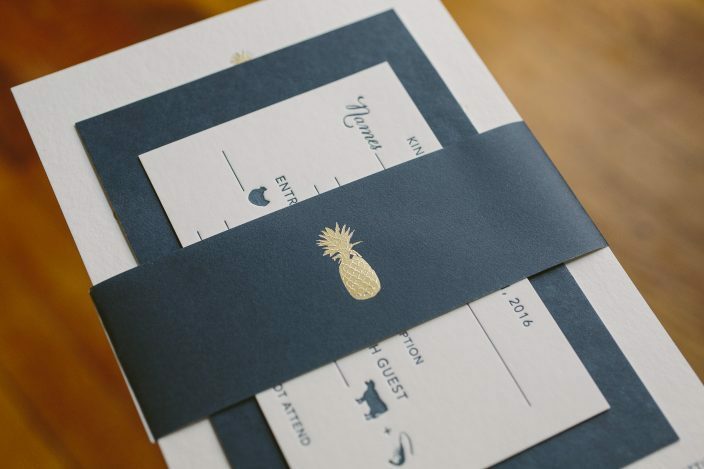 Danielle and Jeffrey worked with our friends at Lion in the Sun to create chic navy and gold pineapple wedding invitations for their Montego Bay celebration in May. 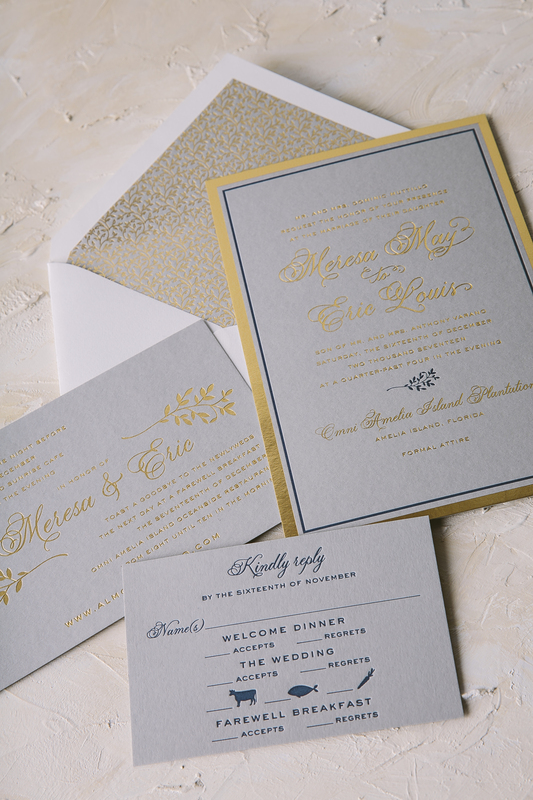 We letterpress printed their invitations in navy ink, and highlighted their names with gold matte foil. Bold navy striped envelope liners reflected the seaside locale, while the gold pineapple motif gave a nod to the Round Hill Resort logo. 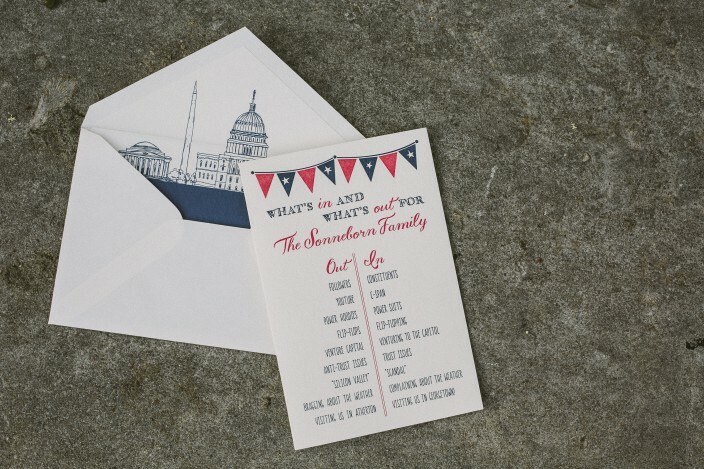 We created a navy combination card that invited guests to both the welcome dinner and the farewell brunch, which resulted in a beautiful layered effect when the invitations were assembled and wrapped with their bellybands. 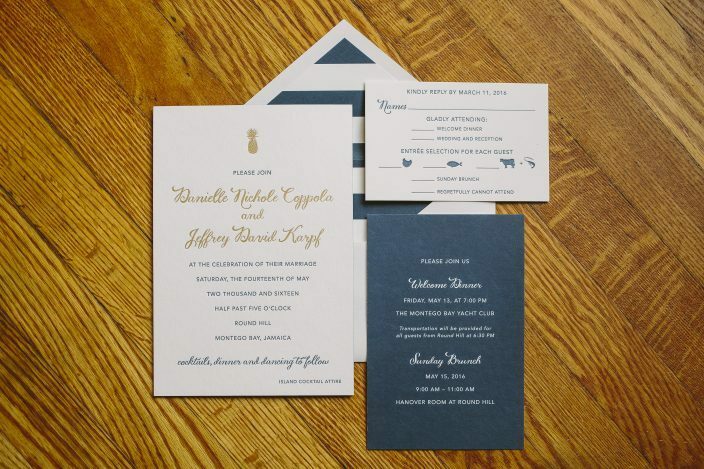 Gold and navy is one of our favorite classic color pairings – and this Keira suite showcased it beautifully. 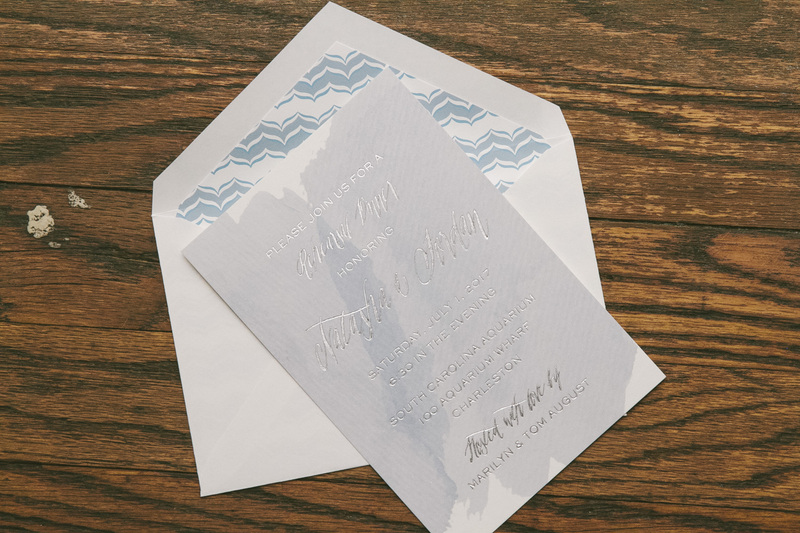 Ryann and and Andrew opted to flip the orientation on the original design to create a vertical invitation, allowing for a more traditional layout for their text. Ruby, one of our exclusive calligraphy fonts (created just us by Molly Jacques) was used throughout the design, giving it a hand-calligraphed feel. 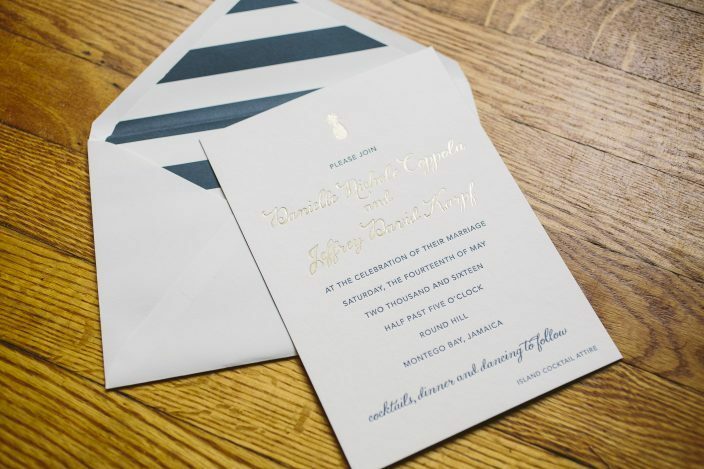 A letterpress and foil stamped invitation sleeve contained each piece, which surely made an impression on every guest who received this stunning set! 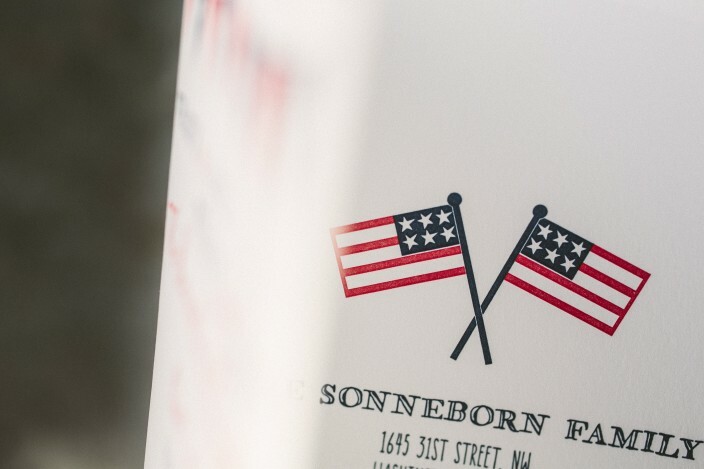 We created these fun moving announcements for the Sonneborn family’s move from California to the nation’s capital. The folded card included a funny list of what’s in and out for the family — some of our favorites included power hoodies for power suits, and Silicon Valley for Scandal. The inside of the card shared the family’s new address, with a note to please visit soon. 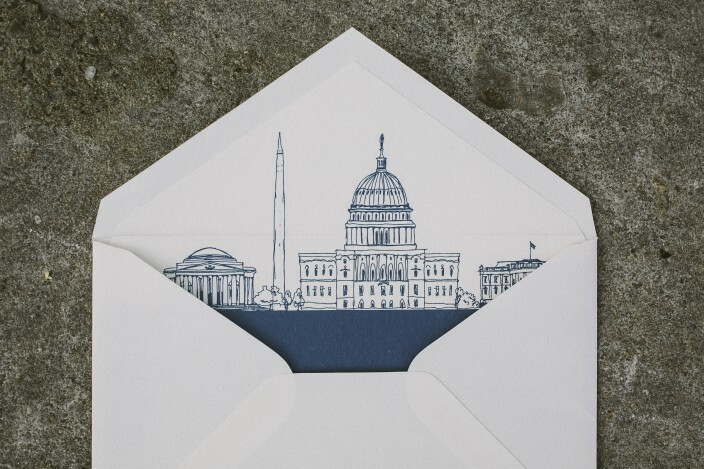 A custom envelope liner complete with iconic DC buildings added an extra patriotic finishing touch. 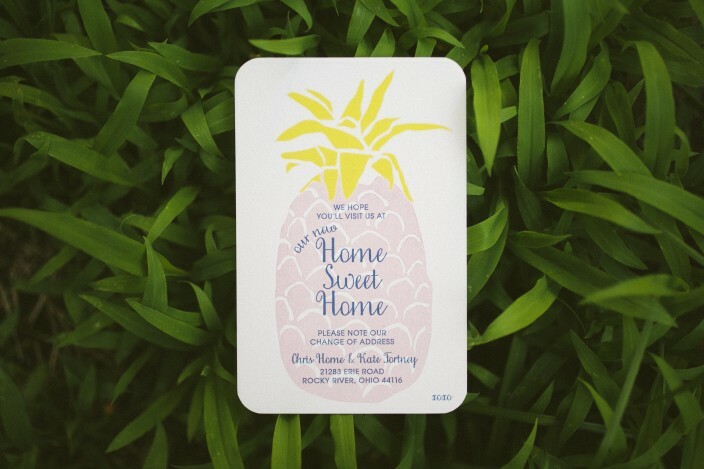 Digitally printed in pink, yellow, and navy inks, these petite moving announcements bear the universal symbol for hospitality: the pineapple. The recorded history of the hospitality pineapple dates back to the late 1400’s. At the time, pineapples were an uncommon luxury, and were displayed and served to guests to provide a warm welcome. We can’t think of a better way to invite family and friends into a new home! Check out Apartment Therapy for their brief history of the hospitality pineapple! Kyle and Nicholas customized our Chapman design for their springtime wedding at Current at Chelsea Piers. 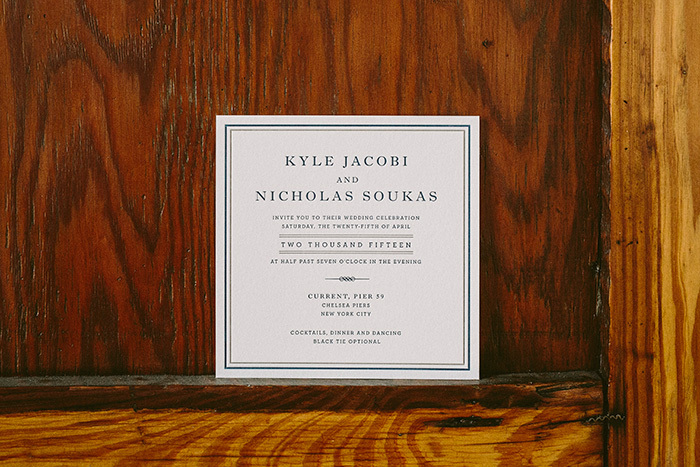 We printed their taupe and navy letterpress wedding invitations on our white bamboo paper. 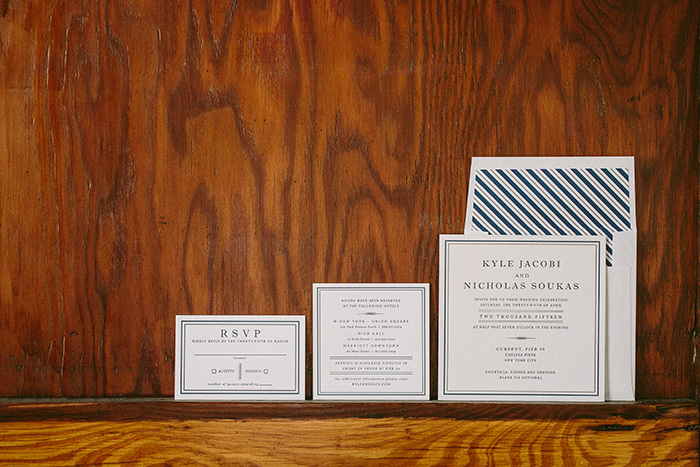 Sleek fonts, a square shape, and a simple striped envelope liner completed the minimalist, modern look that the couple was going for. all site content © 2019 smock.